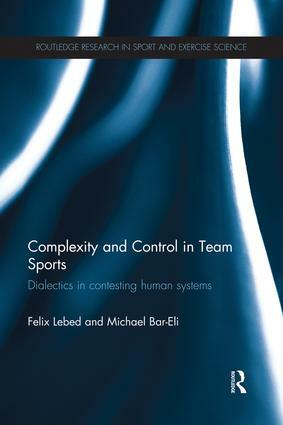 Complexity and Control in Team Sports is the first book to apply complex systems theory to ‘soccer-like’ team games (including basketball, handball and hockey) and to present a framework for understanding and managing the elite sports team as a multi-level complex system. Conventional organizational studies have tended to define team sports as a set of highly heterogeneous physical, mental and cognitive activities within which it is difficult, if not impossible, to find common behavioural playing regularities or universal pedagogies for controlling those activities. Adopting a whole system approach, and exploring the concepts of control, regulation and self-organization, this book argues that it is possible for coaches, managers and psychologists to develop a better understanding of how a complex system works, and therefore, to more successfully manage and influence a team’s performance. This book draws on literature from the biological, behavioural and social sciences, including, psychology, sociology and sports performance analysis, to develop a detailed, interdisciplinary and multi-level picture of the elite sports team. It analyzes behaviour across five inter-connected levels: the team as a ‘managed institution’; coaching staff controlling players via cybernetic flows; the team as a playing unit; the individual player as a complex dynamic system expressed through behaviour; and a player’s complex physiological/biological system. Drawing these together, the book throws fascinating new light on the elite sports team and will be useful reading for all students, researchers or professionals with an interest in sport psychology, sport management, sport coaching, sport performance analysis or complex systems theory. Felix Lebed teaches in the Physical Education Department at Kaye Academic College of Education, Israel. Michael Bar-Eli is Nat Holman Chair in Sports Research at Ben-Gurion University of the Negev, Israel.